Including MD701, MD702, MD703 and MD704, Support European, Asian and USA Car Models from 1996 Year. 3. Autel MD802 can do all-reads and clears trouble codes on both the basic 4 systems (engine, transmission, ABS and airbag) and all the systems. 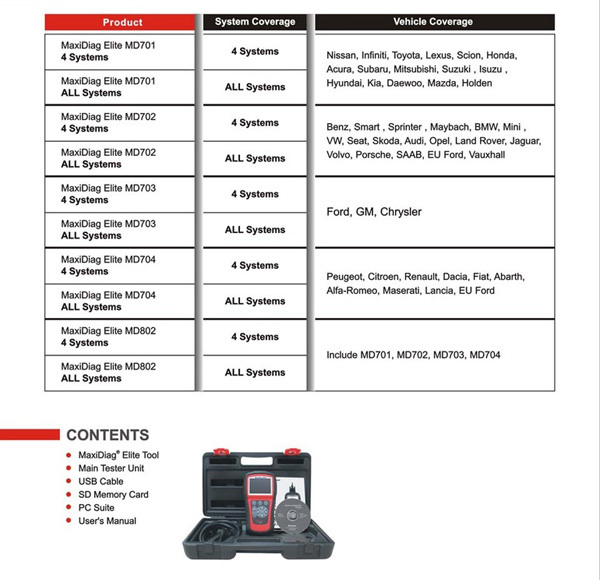 Autel'new MaxiDiag Elite Series, the most advanced and multifunctional scan tools powered by its exclusive technology, are designed for technicians to troubleshoot either the basic four systems or all the systems for most of major vehicles on the road today. This new diagnostic platform delivers fast and easy diagnostics at the right price.